Hi Guy, just wanted to let you know the boots came today and my very picky husband loves them!! thanks for your help and prompt service !! i will recommend you to all my friends! Justin Ladies Bent Rail Western boot in Black Desperado Foot and 11 Inch Black Desperado Top featuring J-Flex Flexible Comfort System Insole for all day comfort. This boot also features a Pointed Snip Toe with Long Base Cowboy Heel and Textured Leather Outsole for long wear. Whether out on the town or working on the ranch, you won't go wrong with the purchase of this fine Justin product. Styled for the. Justin Boots, makers of fine quality western boots boots and shoes since 1879. 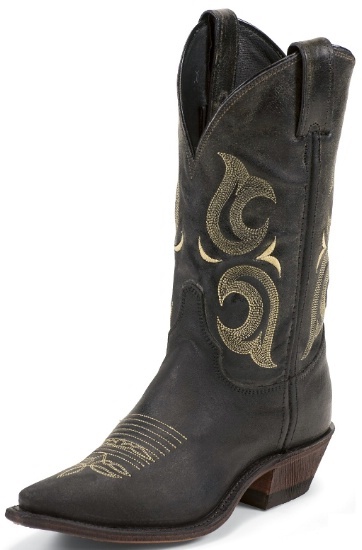 Justin Ladies Bent Rail Western Boot in Black Desperado Foot and 11 Inch Black Desperado Top featuring J-Flex Flexible Comfort System Insole for all day comfort.